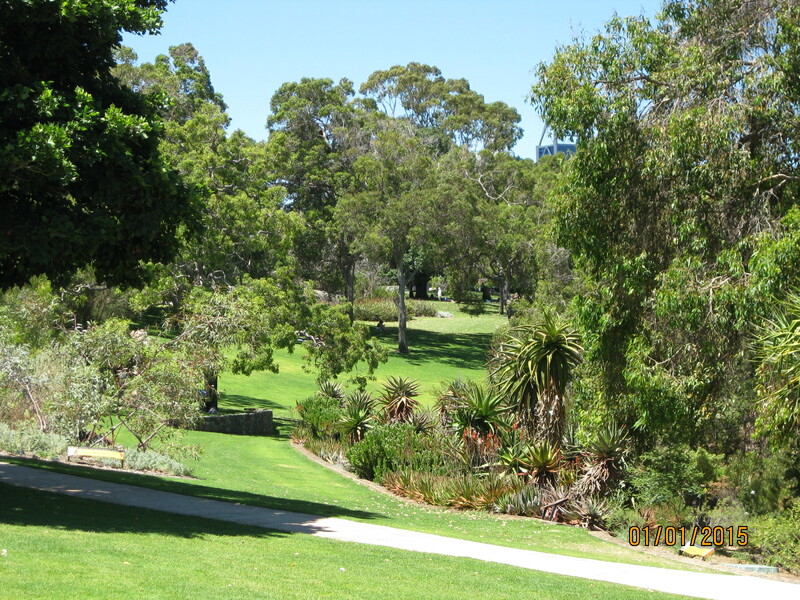 Its close proximity to Perth brought tourists and local people to Kings Park, enjoying the fresh air and open spaces, this New Years Day 2015. 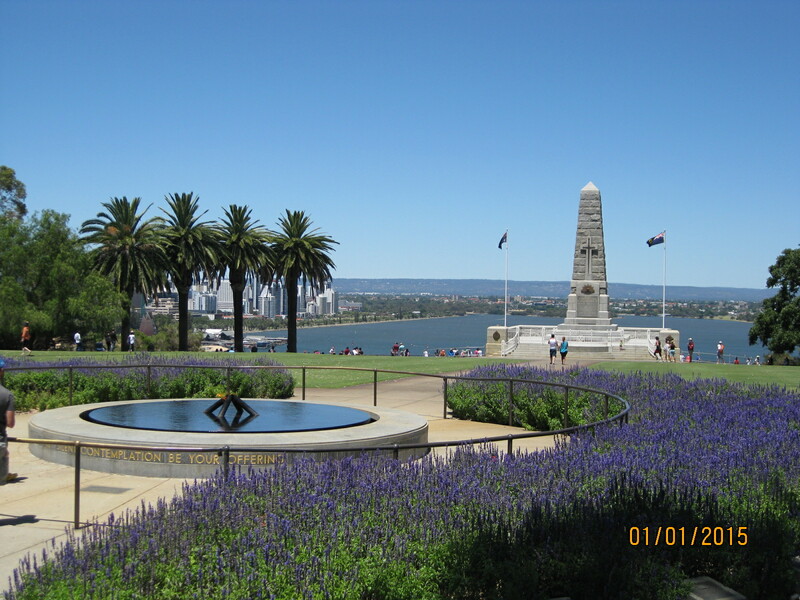 We made our way to the State War Memorial on Mount Eliza overlooking Perth Water. 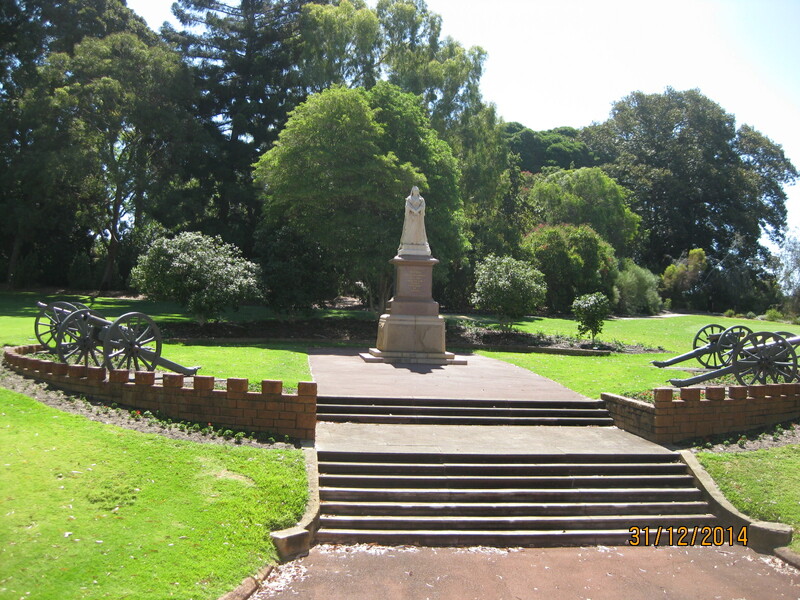 A part of the War Memorial, the Cenotaph includes a roll of honour naming all servicemen and women who gave their lives representing Western Australia in combat: the Boer War; World Wars 1 and 11; the Korean and Vietnam War; most recently in 2012 in Iraq and Afghanistan. 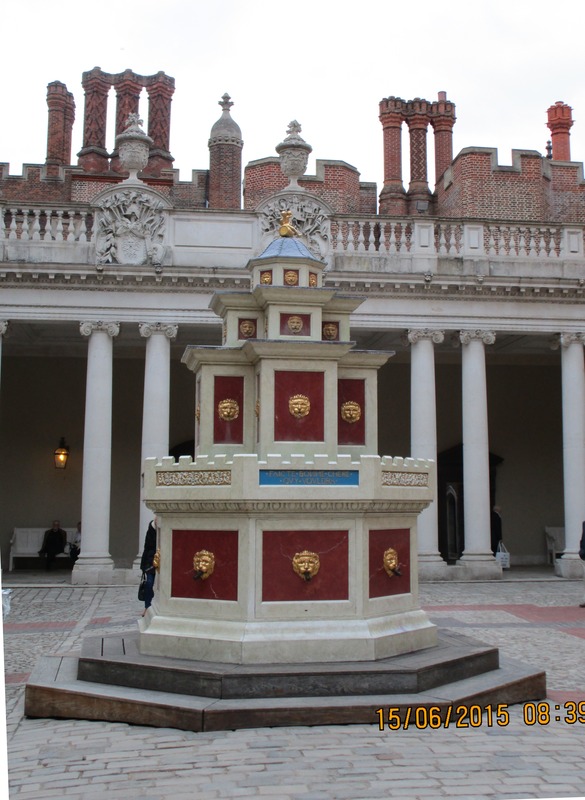 The Flame of Remembrance and Pool of Reflection were inaugurated by Queen Elizabeth 11 during her visit in April 2000. Numerous military memorials are placed around the park. It was humbling, in the embracing heat of New Years Day, to walk along the Honour Avenues lined with eucalyptus trees, where each tree had a plaque in memory of a specific person lost in action: a total over 1100 plaques. 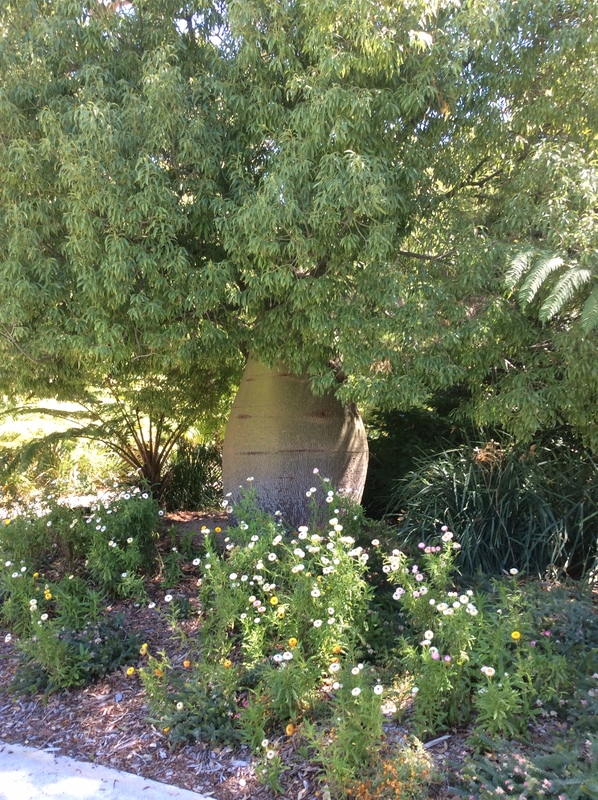 Botanical knowledge of the trees and shrubs that thrive in the soil at Kings Park continues to evolve. 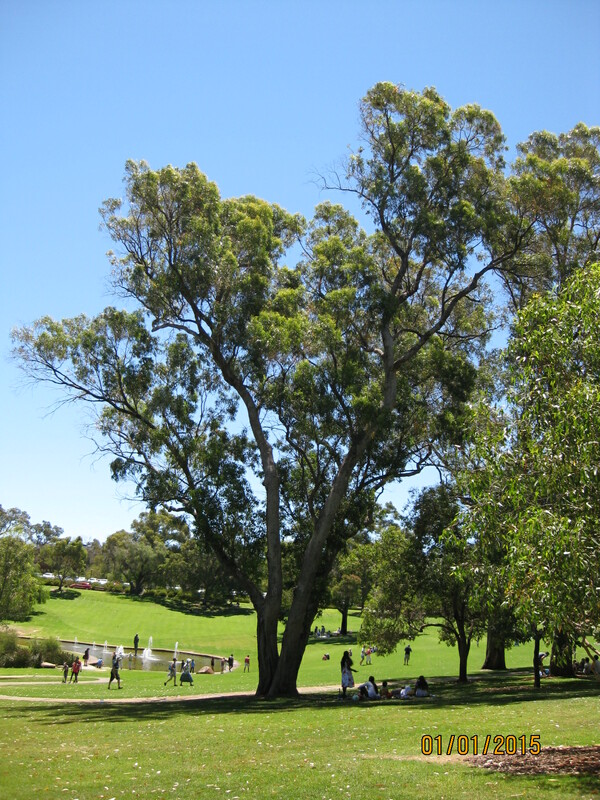 In 1898 red-flowering gum trees, Corymbia ficifolia, were planted along Fraser Avenue to celebrate Queen Victoria’s Jubilee. 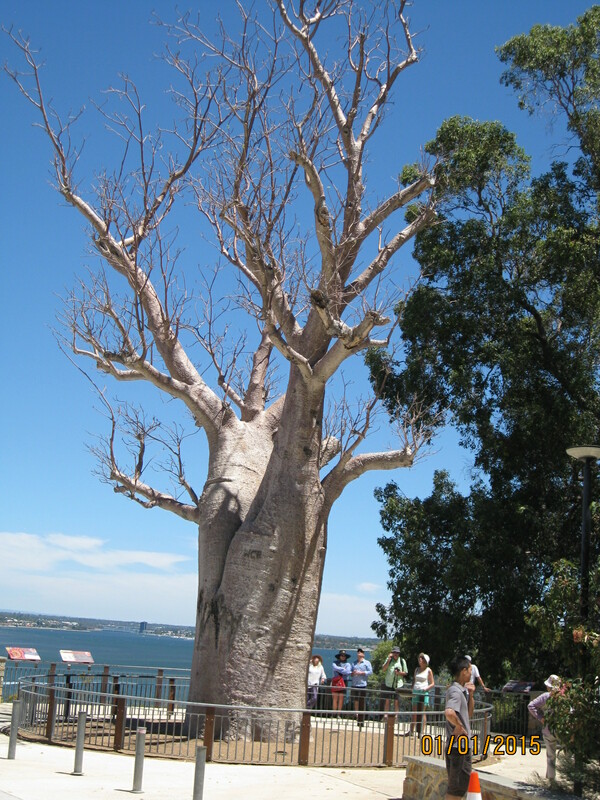 Unfortunately attacked and killed by patch canker disease during the 1930’s, eventually they were replaced with Lemon Scented gum trees, Corymbia citriodora. 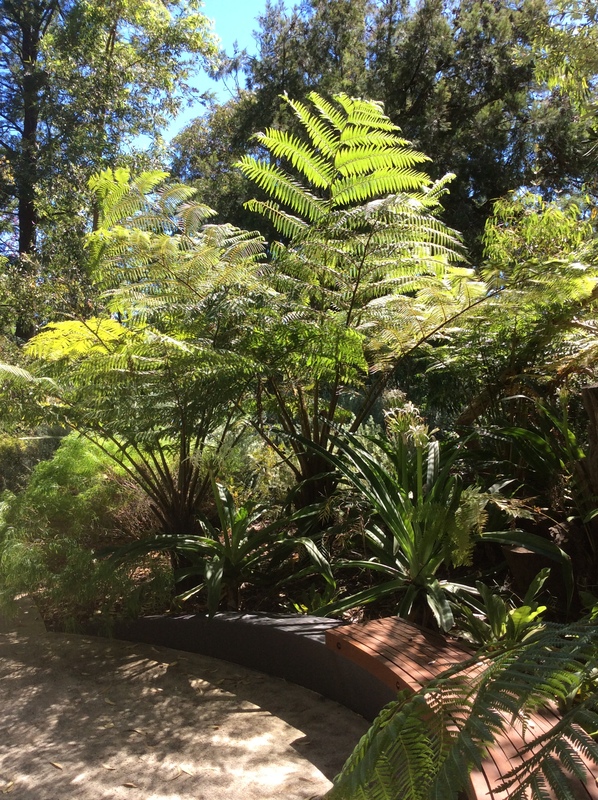 Kings Park consists of 1,000 acres with over 12,000 Australian plant species. 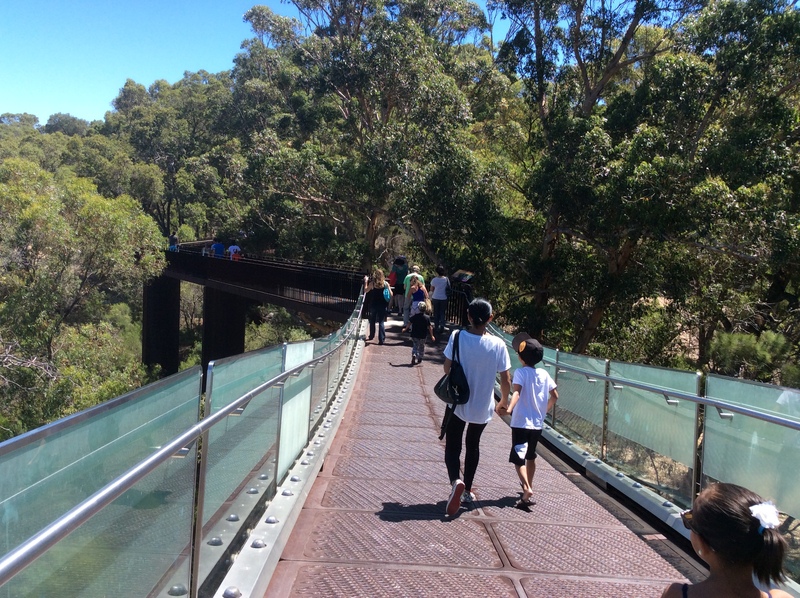 The Lotterywest Federation glass walkway links areas in the 45 acre Botanic Garden, taking visitors high up through shrubs and trees. 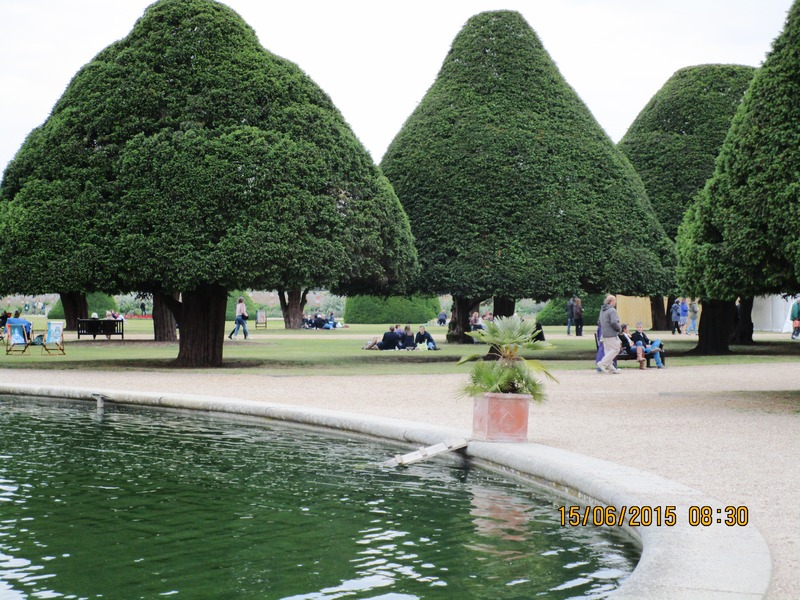 As many local people we met, our taxi driver was proud of the open spaces, monuments and ancient trees in Kings Park. Its easy accessibility to the city and panoramic views across Perth, as well as the Swan River from Mount Eliza, have a unique appeal. 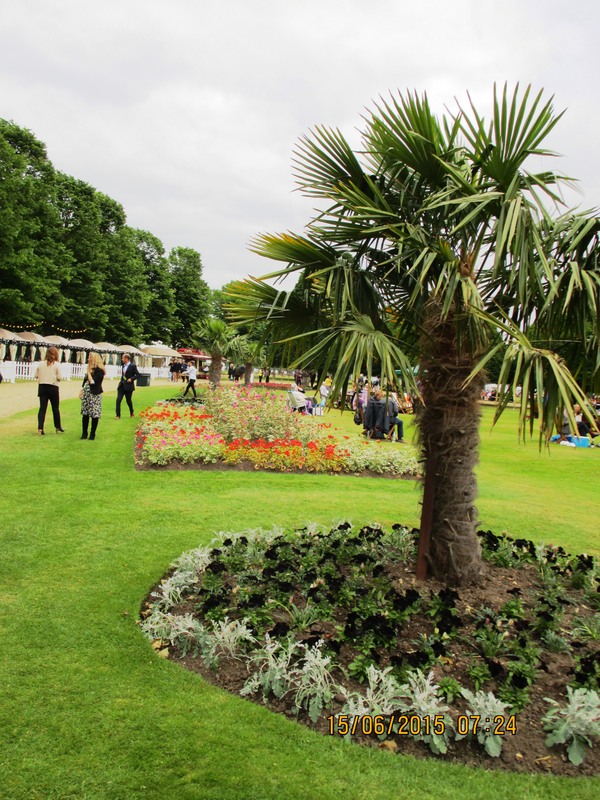 The Park’s history dates back to 1872 when the Surveyor General Malcolm Fraser had the foresight to set aside an area known as Perth Park for public use. In 1890 Perth Park was enlarged to its current size and in 1901 the name was changed to Kings Park, in celebration of the accession of King Edward VII to the British throne. 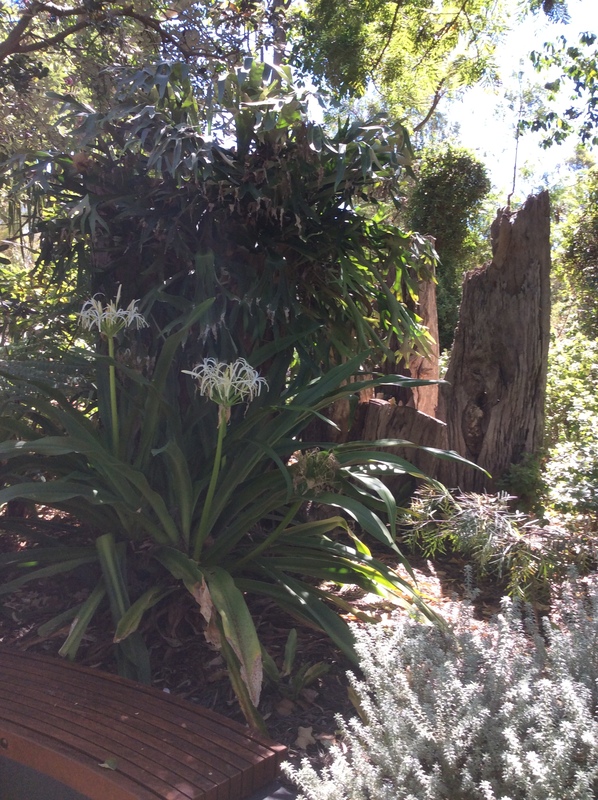 It was great wandering around the Park where we were able to see tree ferns and agapanthus, that we have in our garden at home, in their natural habitats. 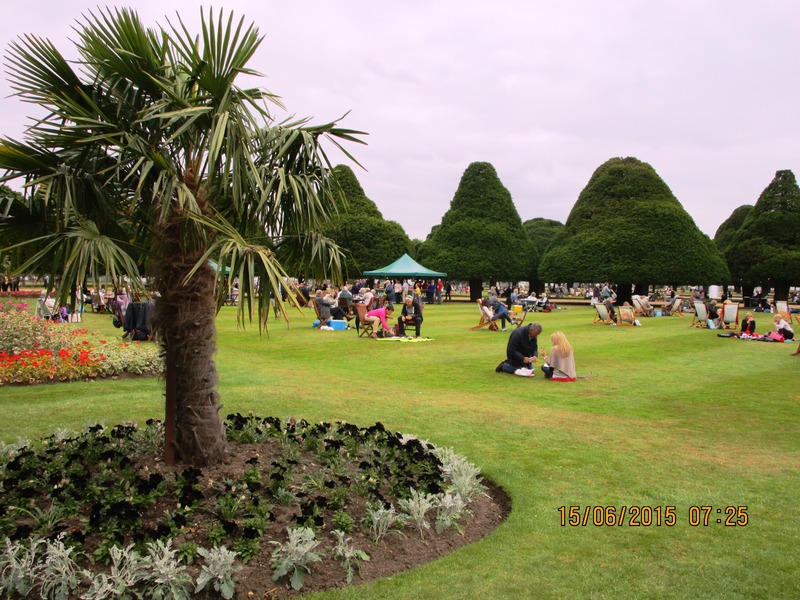 Family groups enjoyed picnics on the spacious grassed areas in the 30 degree plus temperature, many taking the opportunity afterwards to relax by the cooling water of the Pioneer Women’s Memorial Fountain. We punctuated our visit with a tasty fish lunch in the restaurant before a second walk through the botanical gardens and an ice cream, wending our way to the bus stop, physically and emotionally sated. With fellow tourists and Perth residents waiting for a return bus to Perth, we felt lucky to have experienced this unique open space: more so because it is free, no entry or car parking charges. Fantastic! Mention the ‘Isle of Wight’ and memories of family holidays in the 1950’s, when we stayed in then fashionable holiday camps, spring to mind. In Brighstone Bay on the south-west coast, we were awakened each morning by the camp loudspeaker’s ‘Wakey-wakey’ call. Dad put a dressing gown over his pyjamas to queue outside at a strategically stationed tea trolley, returning to our chalet with two cups of tea, for him and Mum. We children raced to find a seat at the long tables set for our breakfast, loving the fact that the adults ate elsewhere. Pocket money purchased a plastic green kite, its ability improved by the extra weight added to its elongated tail, before it was released to fly high above the windy green grass cliff top, together with those of like-minded children. We were well looked after with organised games, running races and swimming competitions in the outdoor pool. I relished racing around outdoors, returning home with prizes for athletics and swimming, no doubt helped by my special black running plimsolls and the ability to swim a mile by the age of 9! Probably I have inherited my love of new places from Mum whose special holiday treats were family visits to the nearby picturesque villages of Brighstone, Niton or Godshill, where small keepsakes were purchased. 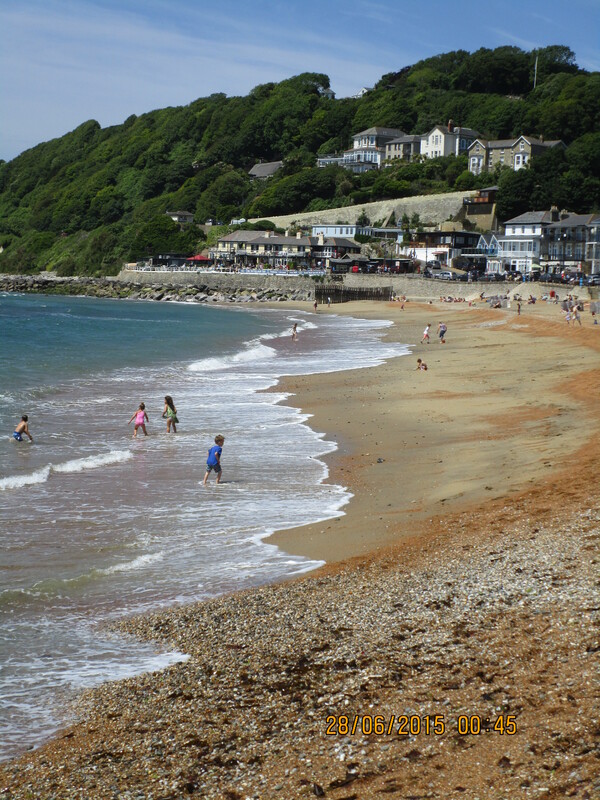 I love still the beach and the sea – the old-fashioned sea-side – so am thrilled to be spending a few days in Ventnor taking advantage of its cliff top and esplanade walks. The Isle of Wight, with its slower pace, is reminiscent of life before our modern urge to rush, race and whizz about, allowing little time to stand and absorb. The holiday starts as soon as the car is parked on the ferry in Portsmouth. Even the cloud could not dampen our anticipation of a relaxing few days. 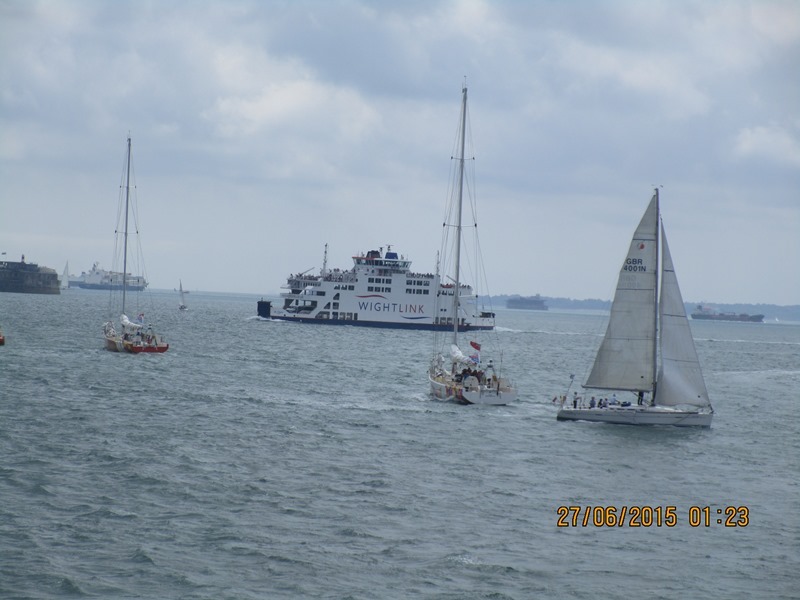 Passing other ferries and boats, the busy Solent reflected the various events taking place on the island this weekend. 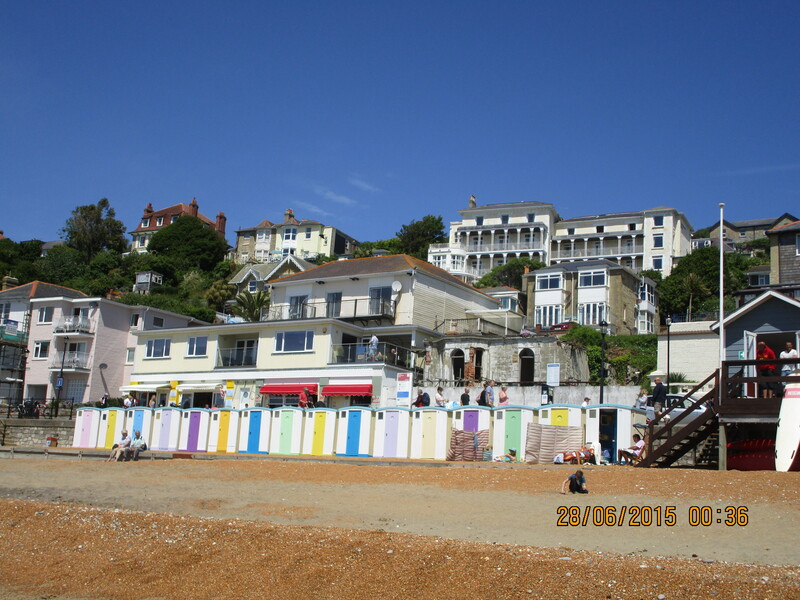 The Royal Hotel in Ventnor was fully booked. 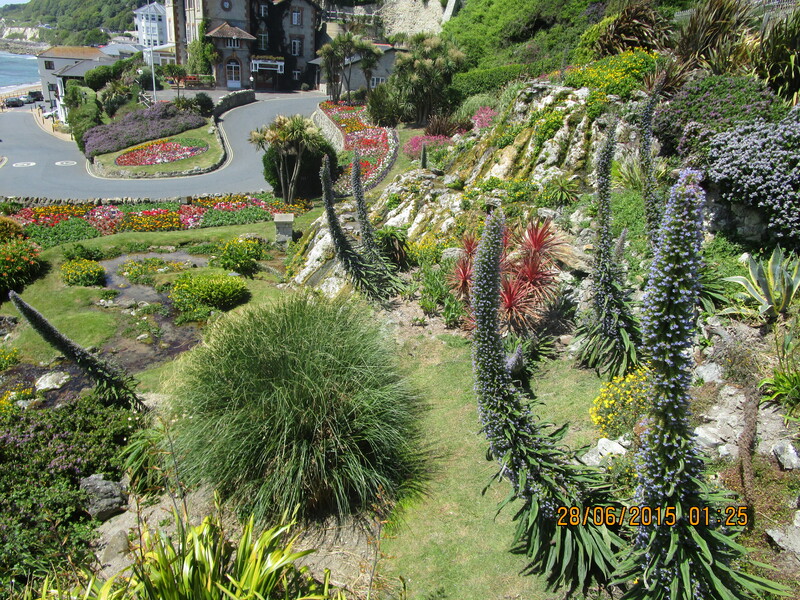 We were staying at the Wellington Hotel with town and sea views and within comfortable walking distance of various cafes and restaurants across from the beach below. The one we chose that evening produced a good meal of local shellfish. Next morning it was past eight o’clock in our comfortable room when the sun shining between heavy floor-to-ceiling curtains called us out. 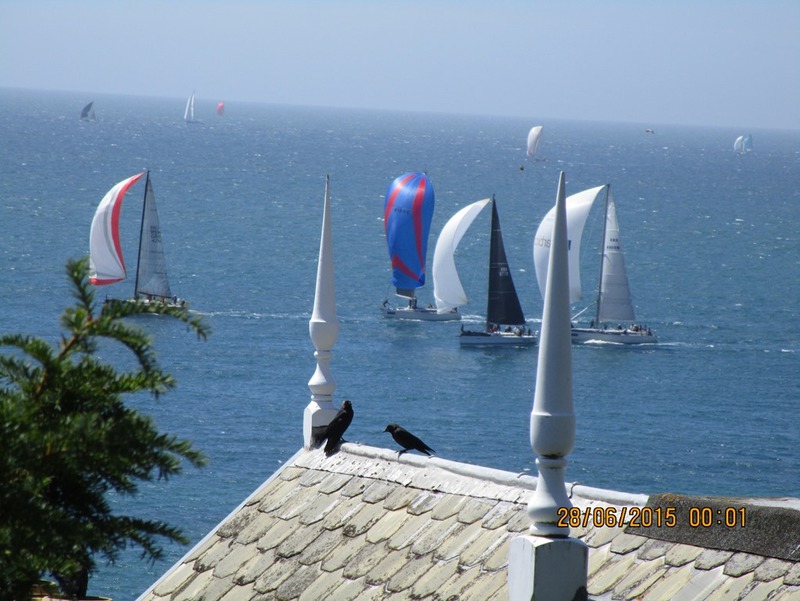 We sipped tea on the wrap-around balcony of the Wellington Hotel’s best room, appreciating its panoramic seascape. 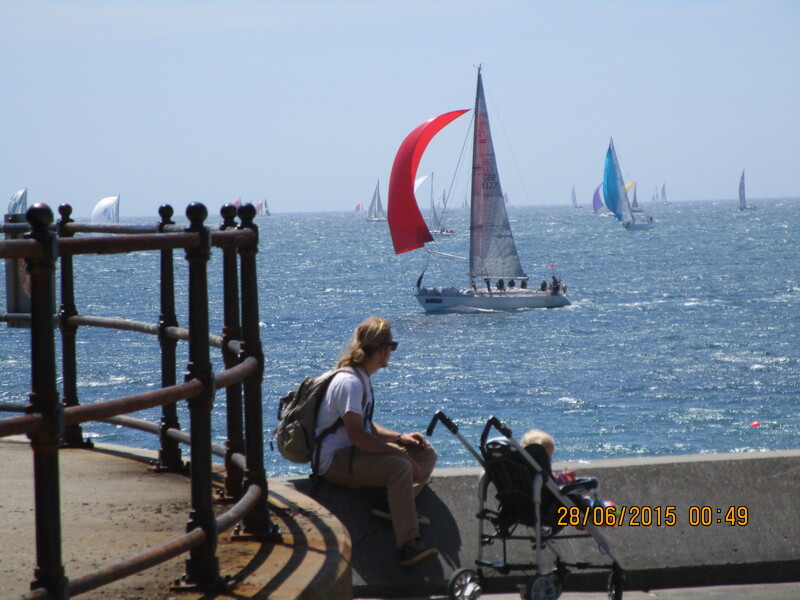 The bird’s eye view showed a few ‘white horses’ on some of the waves, whipped up by the fresh breeze. 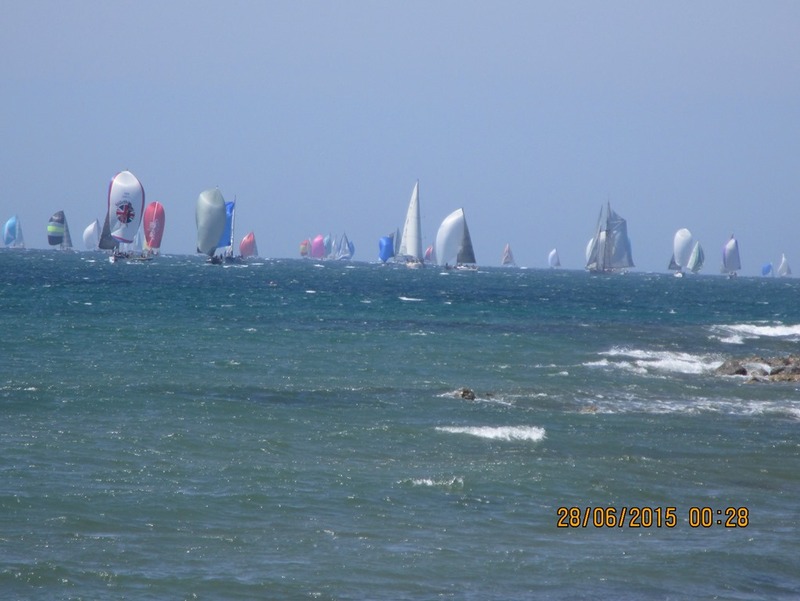 The start was in Cowes where competitors left in stages. 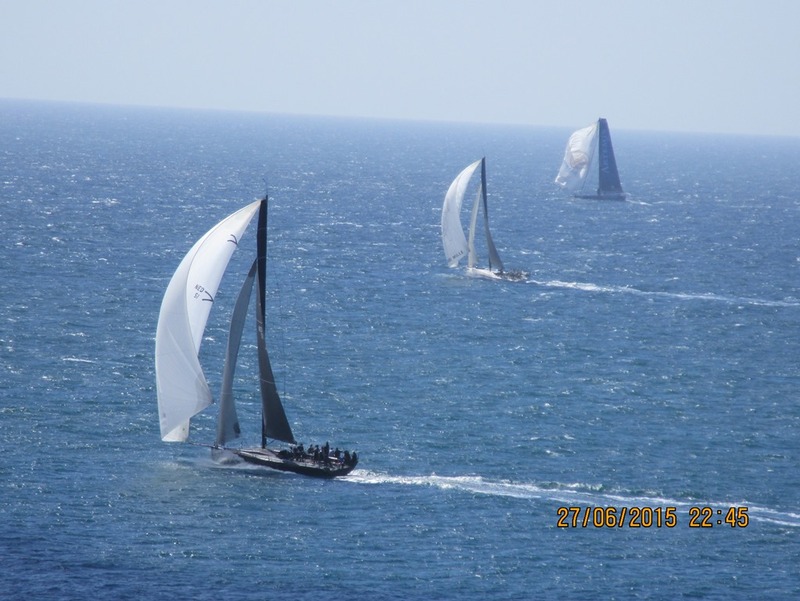 Smaller dinghies were followed by larger vessels over the many hours it took to release the total 1584 entries, all hoping to complete the 50 nautical miles to the finish. 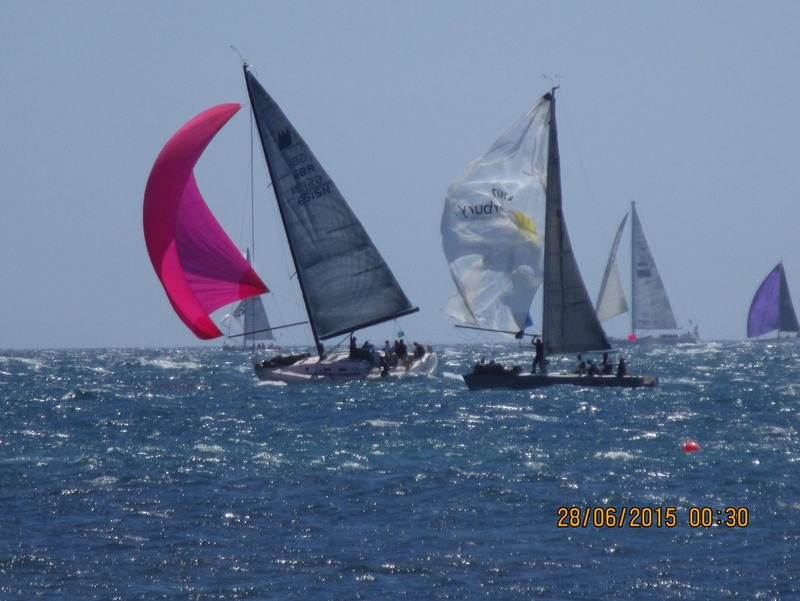 They sailed west past Yarmouth: to Alum Bay with its coloured sands and the historical Needles Battery – a military base built in the 19th century to guard the west end of the Solent – it is located above the familiar chalk stacks that form the Needles. Rounding the Needles, boats enter rougher water off the south coast of the island as they pass the Bays of Freshwater and Brighstone, sailing on to St Catherine’s Lighthouse warning unwary sailors they are approaching the most southern point of the Isle of Wight. 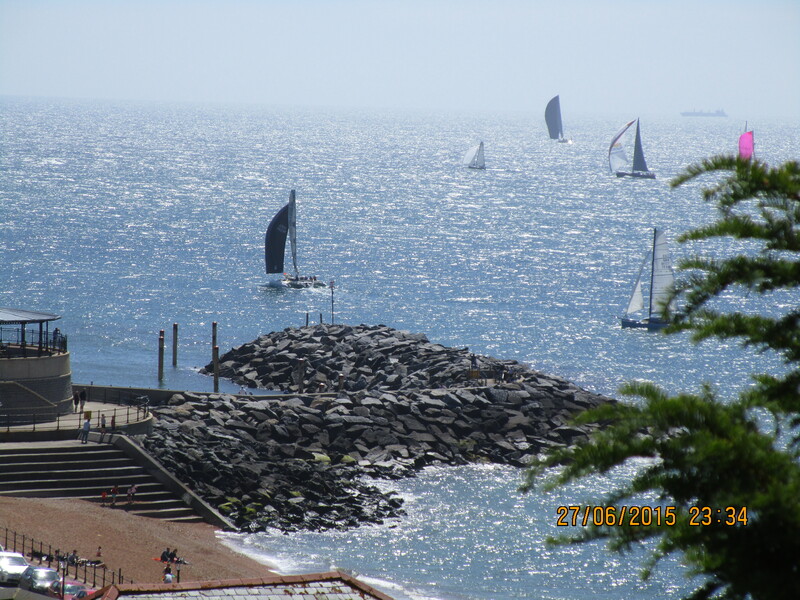 Continuing eastwards, the boats emerge round the western end of Ventnor Bay, behind the Spyglass Inn. 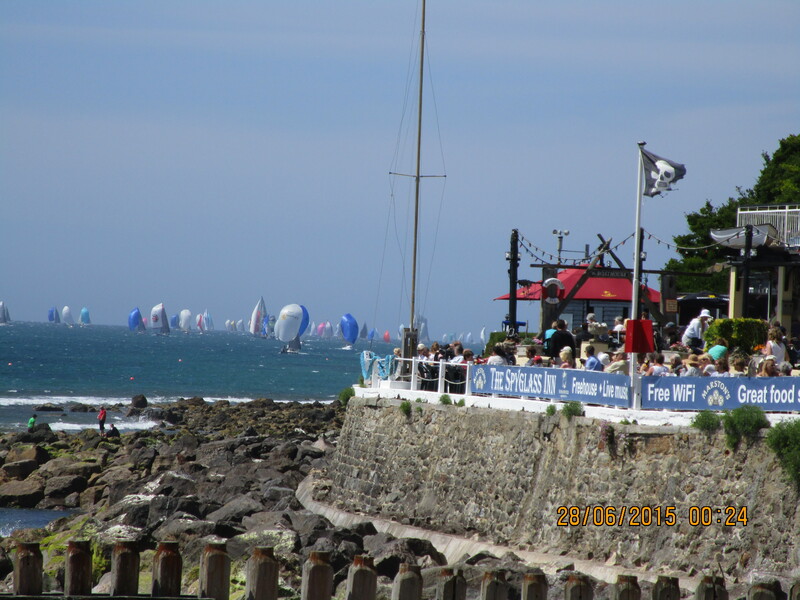 Sails coming into view increased in number so – as we had finished breakfast – we joined other hotel guests outside. Back on our own balcony, we criss-crossed from side to side – snapping and zooming, zooming and snapping – ‘That one leaning with its red sail will make a good photo, no this is better.’ ‘Look, three racing close together….another catching them up.’ So many photo opportunities, it was difficult to stop, just a few more, click, click, click, zoom. 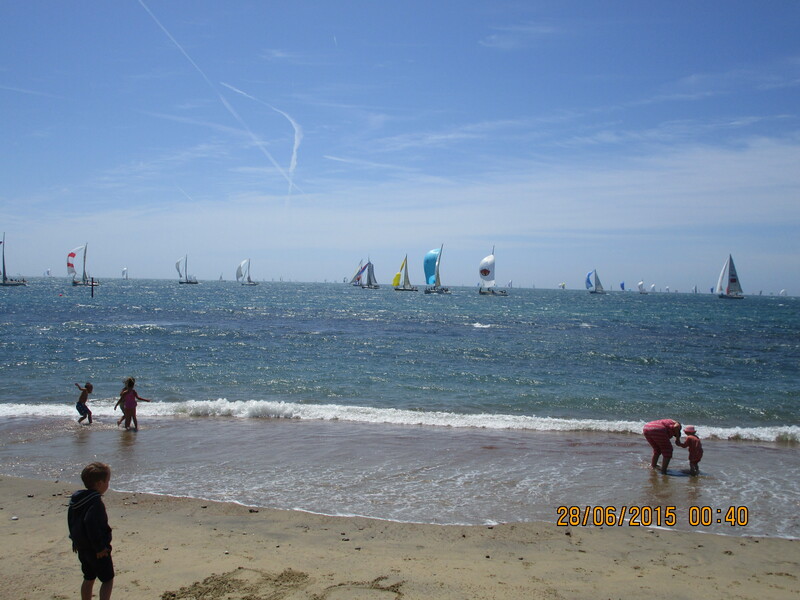 Eventually, seeking more vantage points, we found a steep lane leading to the foreshore where children played ‘chase the waves,’ or dug their toes in the sand, seeming oblivious to the sailors striving for their personal best in the annual competition. 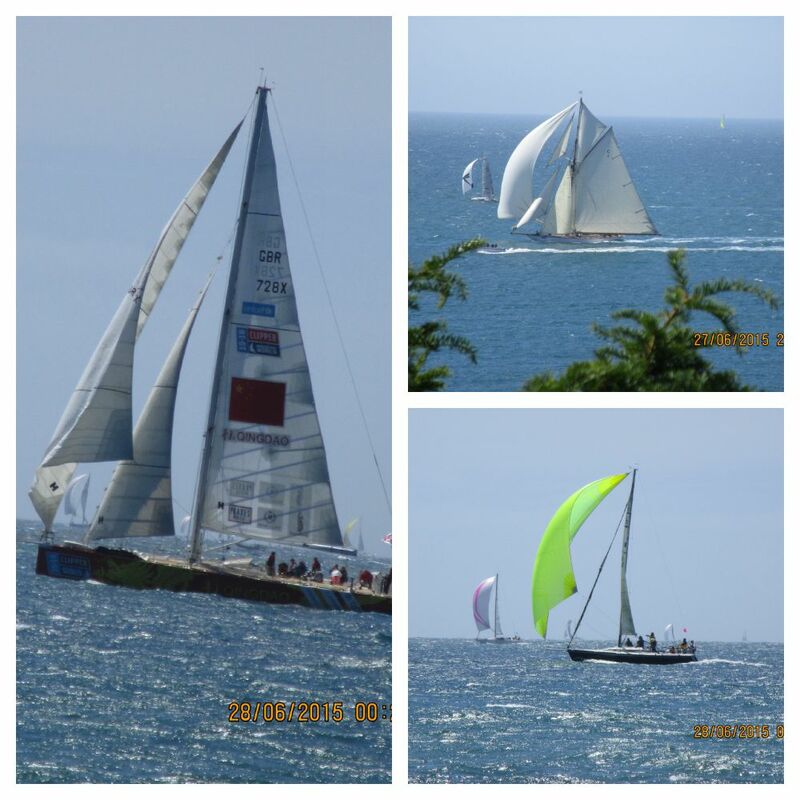 After coffee at the family-owned Spyglass Inn where we took advantage of its proximity to the competing sailors, we meandered along the beach. 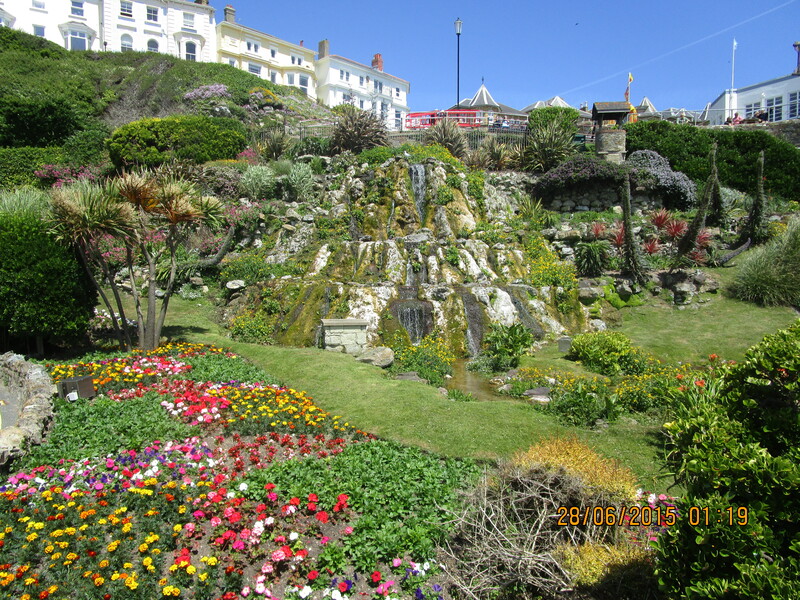 A left turn took us onto the path leading up to the recently renovated Winter Gardens where we paused to admire the waterfall and colourful planting. 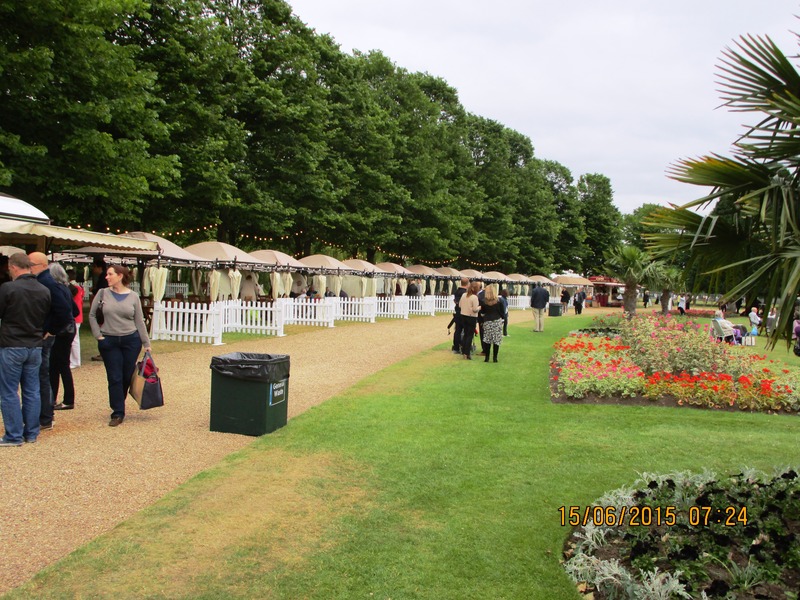 The Winter Gardens re-opened in 2014 after undergoing refurbishment, but is not yet finished. Meanwhile its programme includes tea dances and regular Friday music nights. 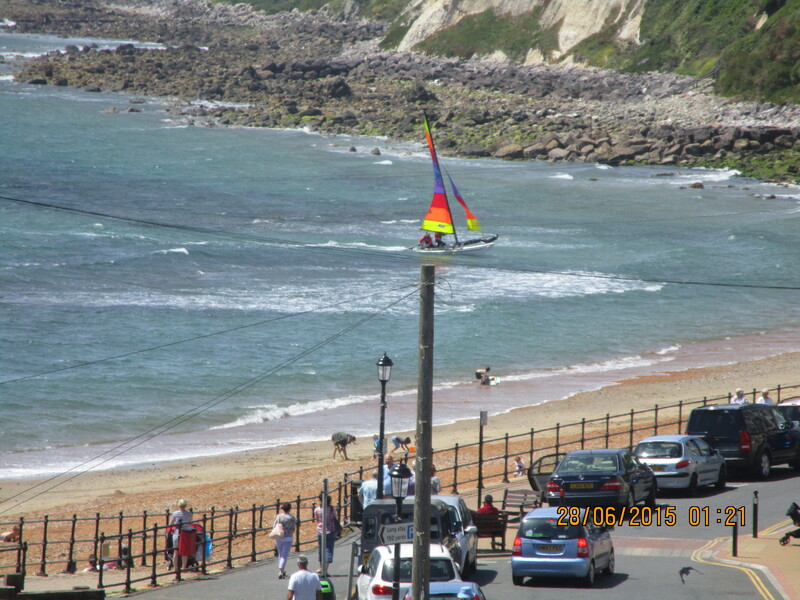 The bar and restaurant are open, providing simple refreshments with excellent views across Ventnor bay. 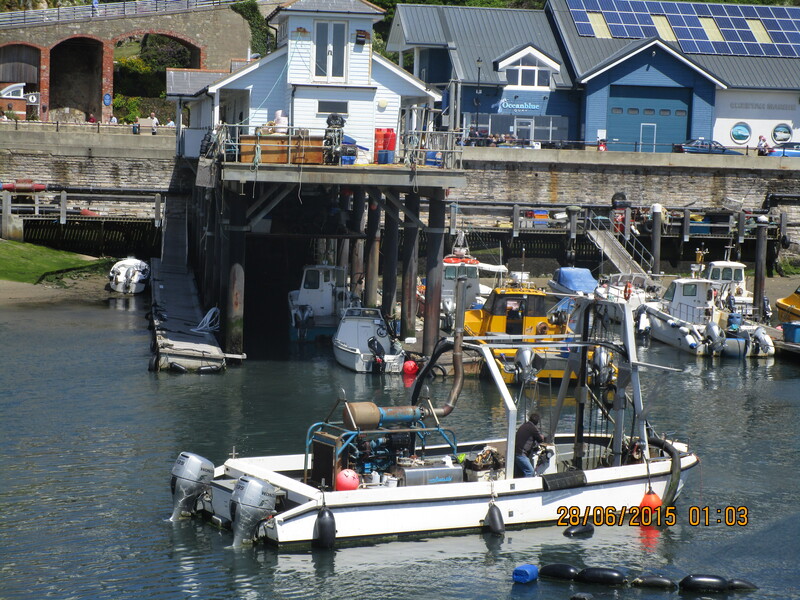 Below the Winter Gardens sits the Haven Harbour, built in 2003 as a safe haven for local fishing and pleasure boats, where mackerel fishing, boat trips, and a sea safari are offered. 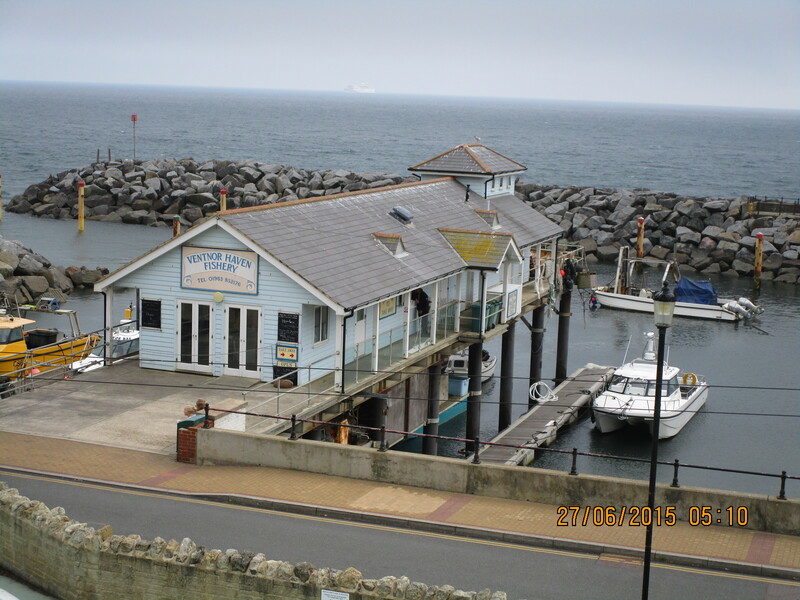 A restaurant, shops, fish and chip takeaway, and workshop used mainly for the fitting of Cheetah Catamarans, add interest to the Ocean Blue Quay. 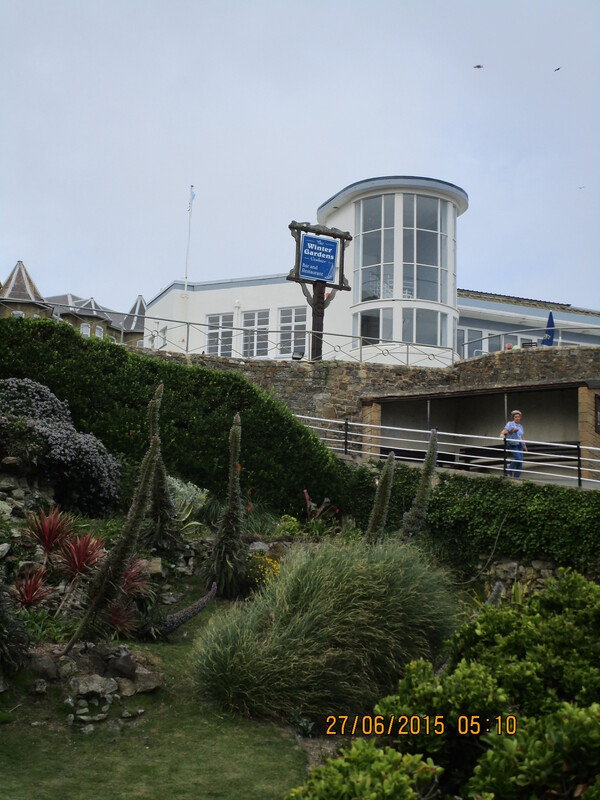 After walking along the Haven wall snapping the boats sailing on towards Shanklin and Sandown Bay, we returned past the Winter Gardens to walk through town, deciding to head towards Steephill Cove for lunch. 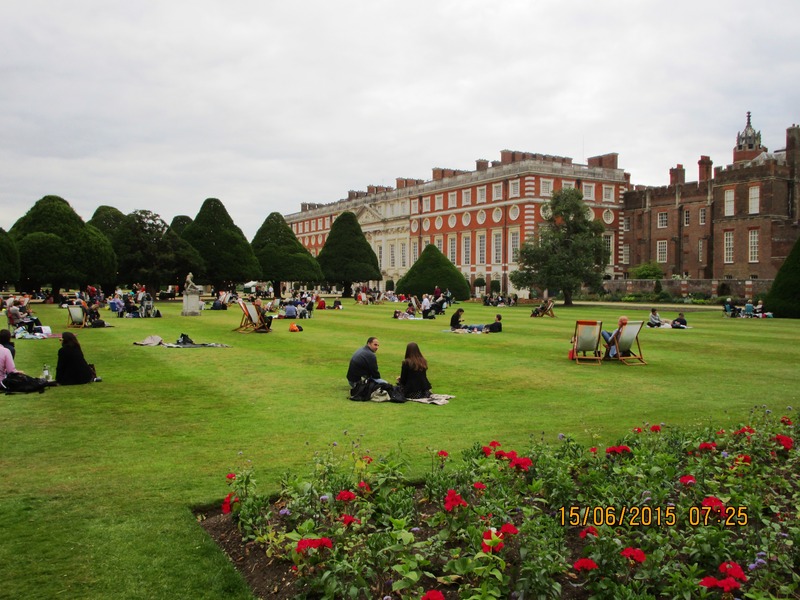 Question: What could be better than sitting outside on a summer evening having a picnic and listening to live music? 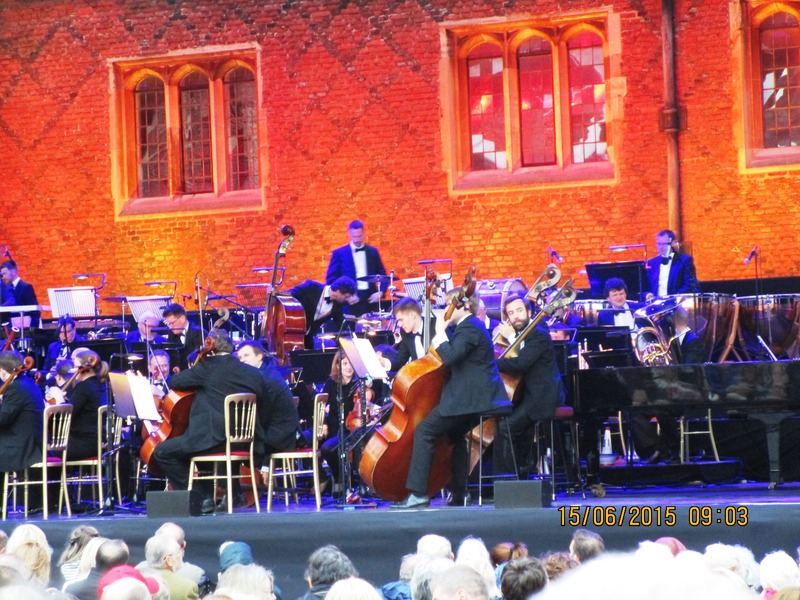 Answer: A leisurely walk around the East Front Gardens of Hampton Court Palace with your best friend: laying a rug on the lawn to picnic with a glass of Champagne, before listening to a world renowned musical performance in a magical setting. 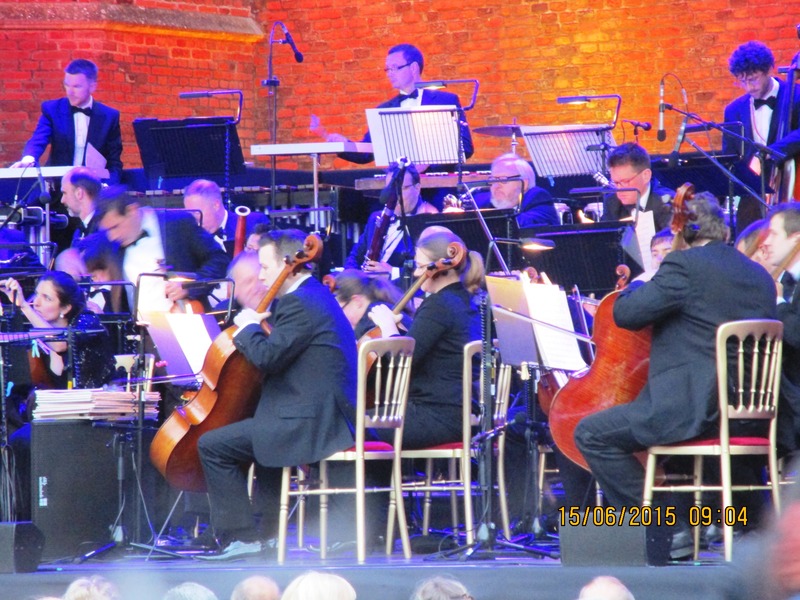 Hearing John Wilson and his Orchestra playing during a televised performance of the Proms at the Royal Albert Hall, encouraged Paul to reserve tickets for their performance at The Hampton Court Palace Festival, this summer. 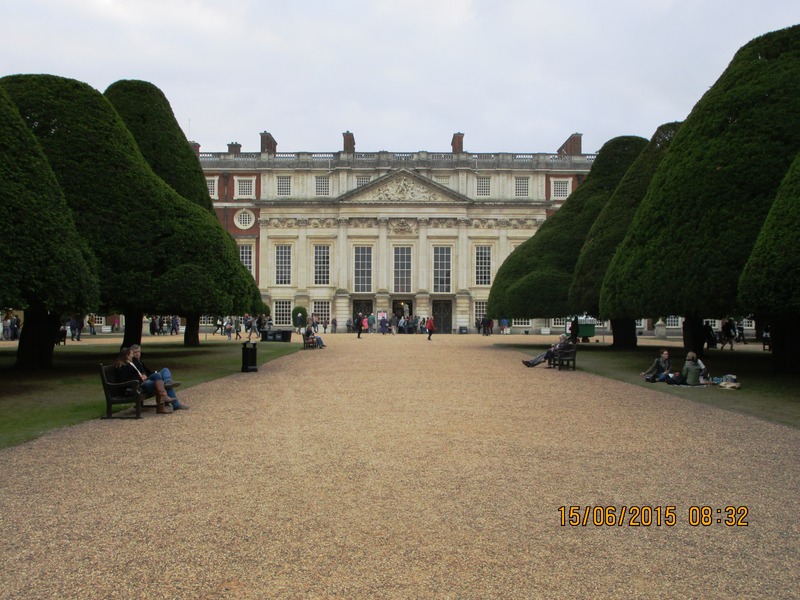 Our 6 pm arrival allowed plenty of time to wander about the spectacular and historic East Front Gardens, appreciating the dry weather, beautifully planted flower beds and fountains, the iconic building and its exciting ambience. 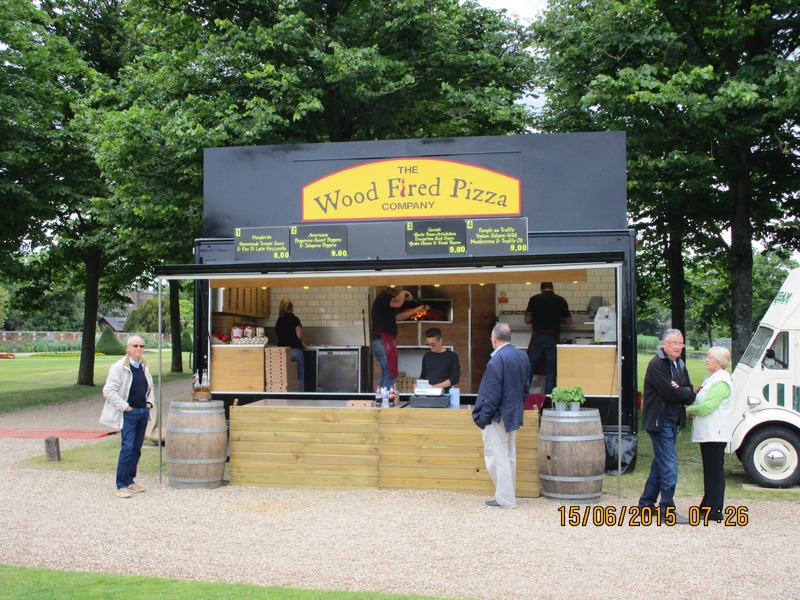 Enough meandering, inclement weather had led us to forego bringing a picnic: the scent of Italian pizzas drew our attention as we spread ourselves and the travel rug over the well kept lawn. 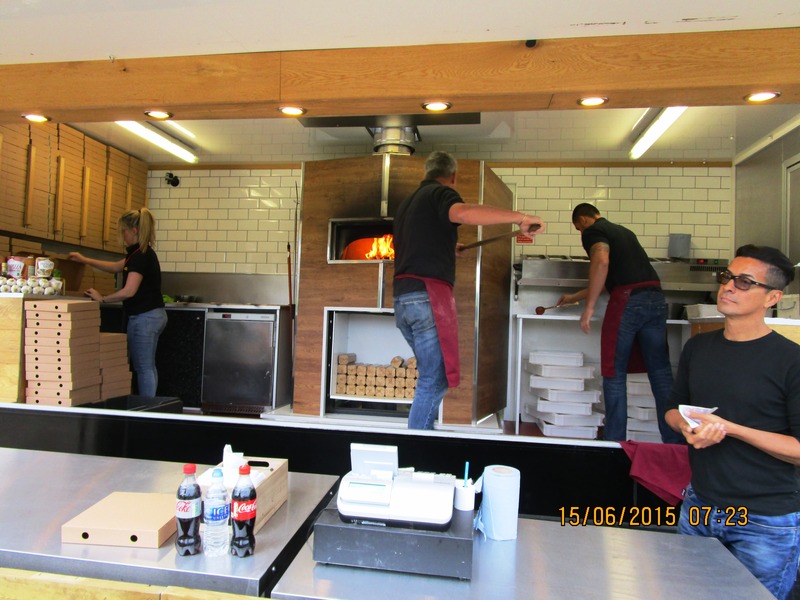 We were soon relishing the stone-baked pizzas that tasted as well as they smelt – delicious with glasses of champagne from the nearby tent. 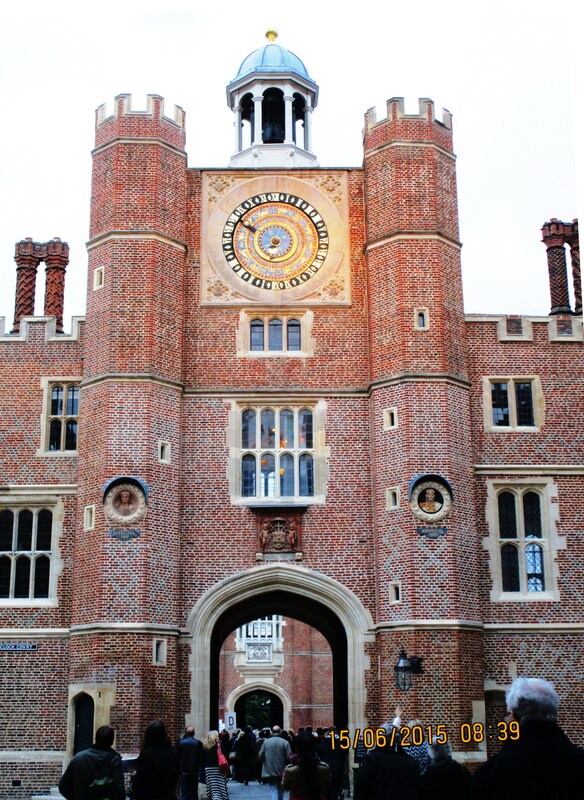 Moving the large number of people from the outside grounds into the Palace took time and, by 7.45 pm the public was being urged to enter the Palace for the fifteen minute walk through to the Tudor Courtyard. Tiers of seats faced the specially made stage while white clouds scudded over an atmosphere of anticipation. The players arrived, a few at a time; the familiar sounds of violins and other instruments tuning up encouraged latecomers to quickly find their seats. An air of expectation settled over the audience. The orchestra was ready. Applause increased as John Wilson walked briskly across the stage. A celebration of MGM Film Musicals had commenced. We were not disappointed. The repertoire included music by my favourites, Cole Porter and Gershwin, among other talented composers: Irving Berlin, Jerome Kern and Andre Previn. Special guest vocalists Anna-Jane Casey and Matt Ford added glamour to the occasion. 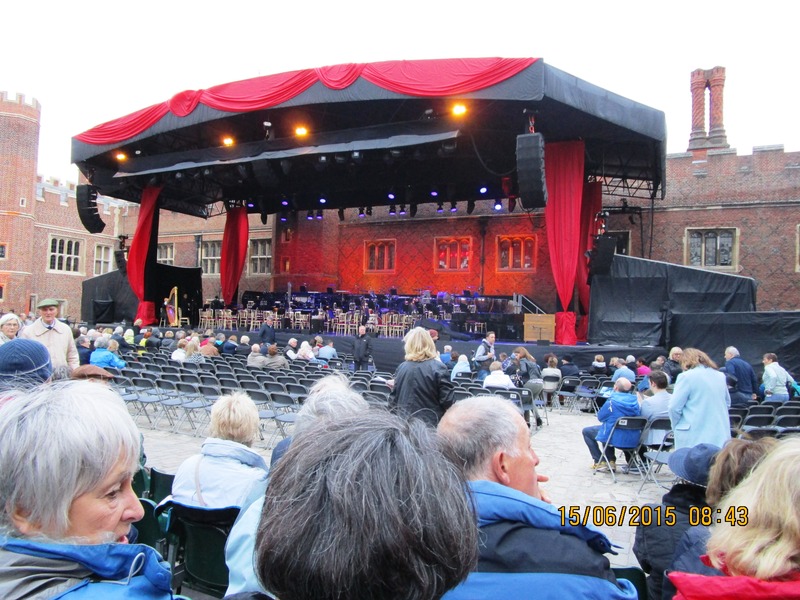 The disappearing sun emphasised lights shining on the red walls: special musical touches and unusual fun sounds from percussion players brought gaiety, while blankets to cushion the hard seats and maintain warm legs, provided outdoor comfort. As an internationally renowned conductor and arranger, John Wilson and his personally chosen ensemble were well able to turn what could have been a tricky situation into an amusing incident. Thirty minutes into the programme, a chilly wind whistled across the stage, lifting sheets of music without favour before depositing them willy nilly, around musicians’ feet. 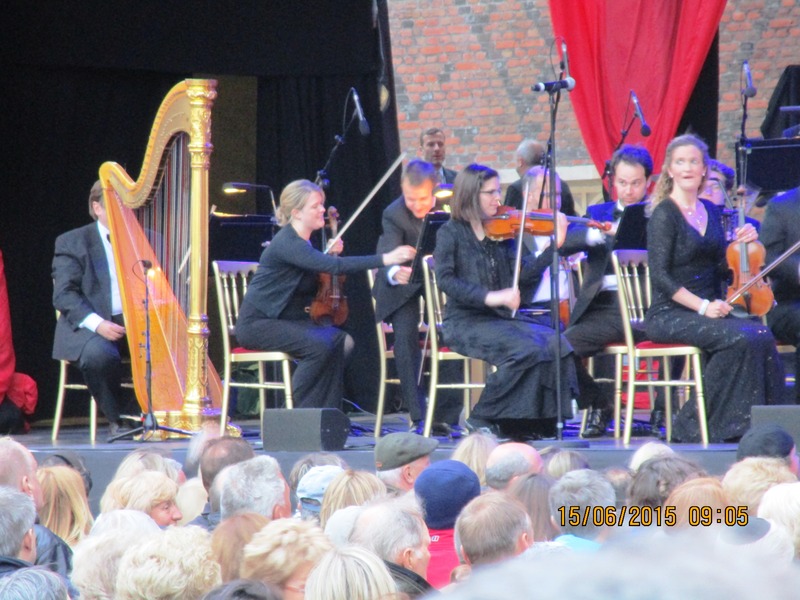 John Wilson made fun as the wind repeated its performance on several occasions: pausing the orchestra between arrangements, to allow one of the drummers to retrieve and replace the important musical scores. 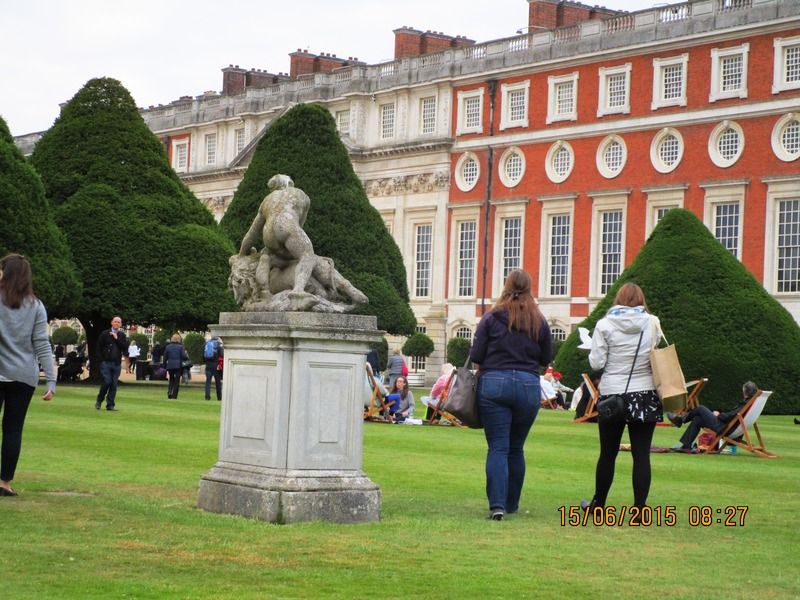 By 10.15 pm the programme had reached its finale, drawing another special evening in the iconic Hampton Court Palace environment to a close. 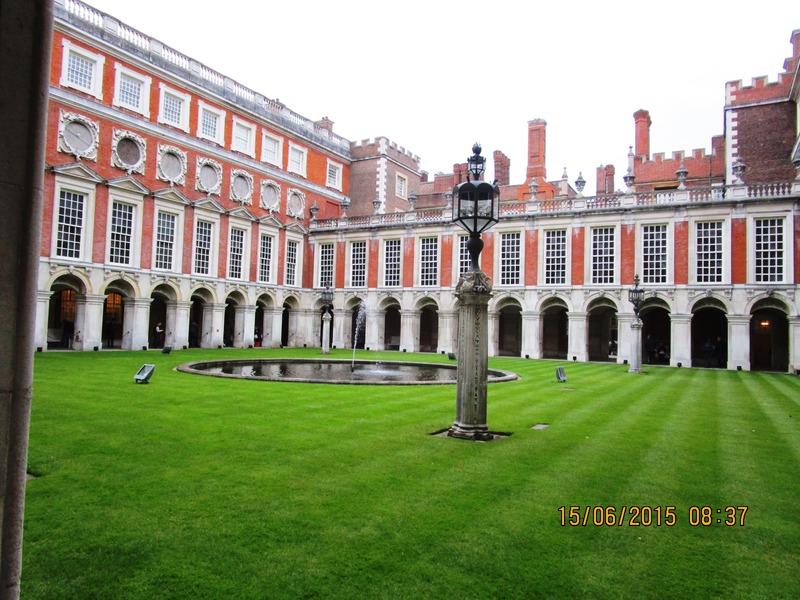 Paul introduced me to The Hampton Court Palace Festival soon after we met. His favourite blues guitarist, Eric Clapton, was appearing with his band. Complimentary champagne in the Waitrose hospitality marquee, and the ‘Star Clipper’ bag purchased during a solo holiday to the Caribbean before I met Paul, encouraged lively conversation with other guests. Afterwards we set up our picnic on the lawn to consume smoked salmon, prawns, and our own special bottle of champagne, in the warmth of the June heat-wave. 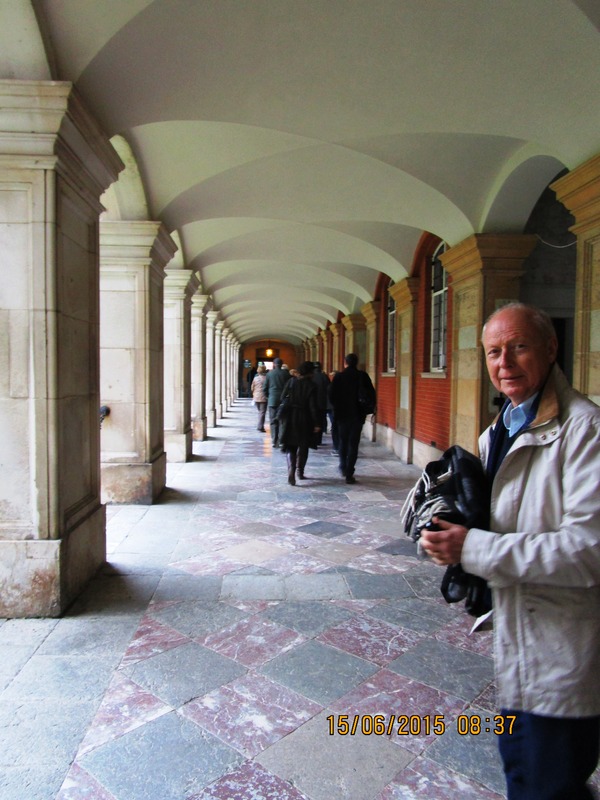 My first Festival – an introduction to Eric’s music in this spectacular setting – remains a special memory.